Located right in the centre of Fort William and popular for walkers exploring Ben Nevis and the spectacular local scenery. 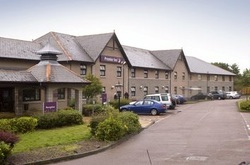 This Premier Inn is located next to the West Highland Museum. Hotel facilities include an on-site Brewers Fayre restaurant serving quality meals throughout the day and free parking. Book direct for the best Premier Inn Fort William deals.